Litrasaurus Quest including this website (http://quest.litrasaurus.com) is owned and operated by Charlotte M Bailey who is also the owner of the Registered Trademark “Litrasaurus”. Litrasaurus is not a commercial enterprise; it is a privately funded charitable endeavour. Charlotte M Bailey reserves all rights with regard to Litrasaurus and its associated websites. Using words Litrasaurus aims to inspire imagination and creativity in the young at heart, irrespective of age or capability or situation, by offering access to children’s literature, both contemporary and classic, as well as providing a platform to encourage and enable the reading, writing and sharing of stories. 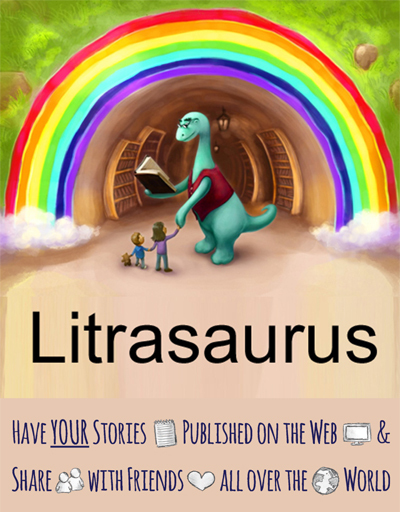 This particular site (http://quest.litrasaurus.com) is a blog designed to engage with adults interested in the role of stories in developing imagination and creativity. We offer this website as a resource for parents, teachers and anyone else involved or interested in encouraging children’s imagination and creativity through stories. Below are all the detailed Terms & Conditions that apply this website. You should read them carefully as by using this website you are explicitly agreeing to them. If you disagree with any part of these Terms & Conditions, please do not use the website. We may change these Terms & Conditions from time to time by updating this page – we do not issue any notifications about this. You should thus check this page regularly to ensure that you are happy with any changes. These particular Terms & Conditions are effective from 21st November 2014. This agreement, and any dispute arising out of your use of the website, or any other aspect of Litrasaurus, are, and shall be, exclusively governed by the laws and courts of England and Wales. Litrasaurus Quest provides access to a range of material, as well as allowing users to submit comments which may be published or distributed electronically (“Services”). The contents of the pages of the website are for your general information and personal, non-commercial, use only. The Services are provided on an ‘as is’ and ‘as available’ basis. We cannot take responsibility for the website being unavailable due to technical problems beyond our control. Furthermore, any aspect of this website and the Services, is subject to change or suspension without notice. We do not offer any warranty, or guarantee, as to the accuracy, timeliness, performance, completeness or suitability of the content on the website, or any other element of the Services, for any particular purpose. You acknowledge that the website and the Services may contain inaccuracies, or errors, and we expressly exclude liability for any such inaccuracies, or errors, to the fullest extent permitted by law. Your use of the website, including any content, is entirely at your own risk, for which we shall not be liable. It shall be your own responsibility to ensure that anything available through the website and the Services meets your requirements. From time to time, the website may also include links to other websites. These links are provided for your convenience. They do not signify that we endorse the other website(s). We have no responsibility for the content or actions of those linked website(s). You do not need to register. You can browse the website and submit comments without registering. When you submit comments on the website we are free to use and/or publish them, or not, at our sole discretion. By submitting a comment, or any other material, to us you are granting us a free-of-charge, non-exclusive, global right to publish it via this website. As part of our marketing and PR (both online and offline) we will occasionally want to refer to, or use material from the website including comments. Unless you advise us in writing to the contrary you will be deemed to have granted us permission to use anything that you have submitted for that purpose should we so wish. Anyone may at any time request that we remove material that they have previously submitted. Such requests should be made in writing – we will comply as quickly as reasonably possible. We will continue to have the right to keep, though not to publish, the material (this is, for instance, because we may need it for internal record-keeping, or because a copy is still held in an archive or backup). We will not return anything submitted by post, so if you are sending us material by post please do ensure that you yourself have kept a copy. You agree that all material that is submitted to us, in whatever form, is the sole responsibility of the person who submitted it. This means that you are entirely responsible, and liable, for anything and everything that you upload, post, email, transmit or otherwise send us. Anything you submit to us must not contain (i) any confidential information (ii) any personal information about another person without that person’s explicit permission (iii) anything which is libellous, defamatory, obscene, indecent, offensive, or in any way unlawful, and (iv) it must not infringe anybody else’s copyright or other proprietary rights. We will, to the best of our ability, take reasonable steps to moderate all content submitted to us in order to ensure that it is not in any way offensive and is appropriate to our audience which may well include significant numbers of children. If you find any material on the website inappropriate or offensive please advise us immediately in writing and, where such material proves to be either inappropriate and/or offensive, we will remove it as quickly as reasonably possible. We cannot be held liable for the inappropriateness or any offence caused by material submitted to us, any such liability rests with the person who submitted the material. We cannot monitor or check the copyright of material submitted to us. If you find any material on the website that you believe is in breach of copyright please advise us immediately in writing and where such material proves to be in breach of copyright we will remove it as quickly as reasonably possible. We cannot be held liable for any breach of copyright with regard to material submitted to us, any such liability rests with the person who submitted the material, unless, of course, we have published it with explicit prior knowledge that it would be in breach of copyright. Firstly, to assist you, here is a link to information about copyright provided by the Intellectual Property Office which is the official government body responsible for granting Intellectual Property (IP) rights in the United Kingdom http://www.ipo.gov.uk/copy. The website and the Services contain material which is owned by or licensed to us (material that you submit to us is, by virtue of these Terms & Conditions, being licensed to us by you). This material includes, but is not limited to, the design, layout, look, appearance, graphics, images, and text. Any use of this material is prohibited other than in accordance with these Terms & Conditions. Any unauthorised use of this material may give rise to a claim for damages and/or be a criminal offence. You agree (i) not to copy, or print out, any part of this material other than for your own personal use, and (ii) not to reproduce, distribute, sell, trade, or exploit this material in any way commercially, or otherwise. You acknowledge that we have no control over use by third parties of material published on the website and that we are not liable for any loss or damage of any kind (including, without limitation, any intellectual property or copyright infringement), resulting from any use of this website or the Services which is in breach of these Terms & Conditions. You agree to indemnify us against any and all liability, costs, damages and losses (including legal fees incurred and any compensation paid) incurred by us as a result of any breach by you of these Terms & Conditions, specifically including the submission of any material particularly its copyright. To the fullest extent permitted by law we will not be liable to you, and/or any other person, for any damages either direct, indirect, incidental, special, consequential or exemplary resulting from, or in connection with, your use, or inability to use, the Services or in relation to any material submitted to us, or any other matter relating to the Services, even if we have been advised of the possibility of such damages and even in the event of fault, tort or liability. These Terms & Conditions constitute the entire understanding between you and us with respect to the subject matter of these Terms & Conditions and supersede all prior agreements between us. If any part or parts of these Terms & Conditions are held to be legally invalid or unenforceable, the remaining provisions shall continue to apply with the offending part or parts removed. We are committed to safeguarding the privacy and safety of our website visitors. We are particularly aware that a substantial number of visitors may well be children and as such we will be especially careful in terms of safeguarding privacy as well as ensuring the content of the site including any contributions that we publish are appropriate to this audience. We want you to be able to take part fully in other website, and any other Litrasaurus activities whilst ensuring that, where we collect personal information about you, we do so in a way that does not infringe your right to privacy. We may collect, store and use personal information that you provide to us for the purposes of registering or subscribing or contacting us. We will require from you the minimum amount of personal information necessary which is generally only name and/or email address. Personal information that you provide to us will not be accessed by any third party other than employees or contractors working directly for us who will be appropriately bound by our agreements with them. A cookie is a small file which, with your permission, is placed on your computer’s hard drive. The cookie helps and allows websites to respond to you as an individual by tailoring web applications to your needs, likes and dislikes. It does so by gathering and remembering information about your choices and preferences. Cookies do not identify you personally, just the presence of your browser. Session cookies will be deleted from your computer when you close your browser. Any disclosure will only be made to the extent that we are required to do so by law. You expressly agree to such transfers of personal and other information. We will take reasonable technical and organisational precautions to prevent the loss, misuse or alteration of your personal information. We use industry standard software and hosting providers meaning your data is stored on secure (password- and firewall- protected) servers. You are responsible for keeping any passwords and user details confidential. We will not ask you for your password. You may instruct us to provide you with any personal information we hold about you. Provision of such information is subject to current UK data protection legislation and may be subject to a fee. We have submitted our registration under the Data Protection Act to the UK Information Commissioner’s Office (this registration relates to Litrasaurus including the entire domain www.litrasaurus.com within which is quest.litrasaurus.com). If you believe that any information we are holding on you is incorrect or incomplete or out of date, please write to or email us as soon as possible. We will promptly correct any information found to be incorrect.